How to Fix "Remove Credit Card from Apple ID No None Option"
Would you like to know why you can’t remove your credit card from Apple ID, or change your payment /credit card information to “None” in the iTunes Store, App Store, Apple Books, or Mac App Store? This issue could arise due to many reasons and factors, but for every cause, there is a solution. Therefore, if you don’t want to use a credit card on your Apple ID anymore (i.e. you already have your credit card associated to an Apple ID but would like to remove the credit card from the Apple ID), then this post is for you. Here, we’ll teach you how to remove a credit card from your Apple ID payment information. More so, we will also discuss what do if you forgot your Apple ID password when trying to edit Apple ID payment information. Step 1. Sign in to the iTunes App Store. Step 2. You may be notified that “there was a billing issue with your last order”. Click the “Billing Info” button to see the order. Step 3. Pay for the order and try changing your payment information to None. If you have a subscription that automatically renews, you may not be able to select “None” option until you cancel the subscription. Click HERE to learn how to cancel any type of Apple service subscription. If you’re setting up the App Store or iTunes Store for the first time with an existing Apple ID, Apple will require you to provide a payment method. However, after you create the account, you can change the payment information to None. If you want to create an Apple ID for the first time, and chose the United States as your country of residence while you’re on a tour in Jamaica, Apple will require you to provide a valid payment method. You’ll have to enter the details of your credit card, and you won’t be able to choose “None” as an option. If you have changed your country or region, you will be required to change your payment method and update your billing info. If you haven’t done so, you can’t choose “None” as an option until your edit your payment information. If you, a friend or family member creates a family sharing account, the organizer must provide a valid payment option. This payment option must be used to make all purchases initiated by anyone in the family sharing account, and can only be changed by the organizer. The “None” option is not available to family groups, and if you must stop family sharing because of “None” option, you must disband the family group. If you forgot your Apple ID password and couldn’t change your payment information, don’t be discouraged; there is a solution for you. 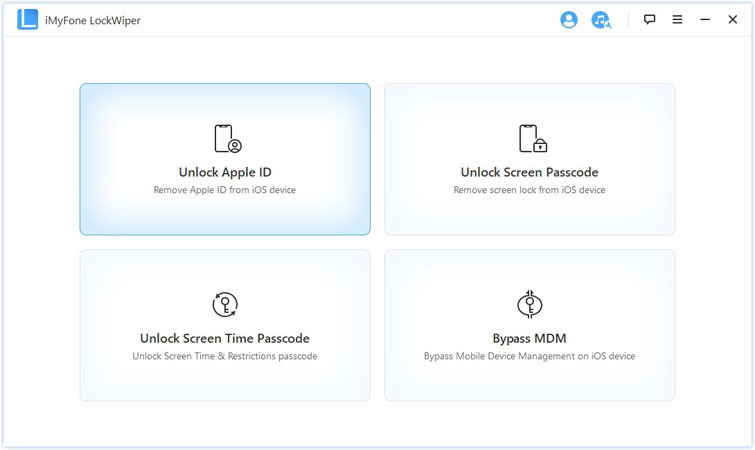 iMyFone LockWiper is the solution that can help you remove Apple ID and iCloud account from your iOS device without a password, thereby giving you the privilege to set up a new account on the device or add an existing iCloud account to the device. Remove credit card from Apple ID payment information when “None” option is missing. 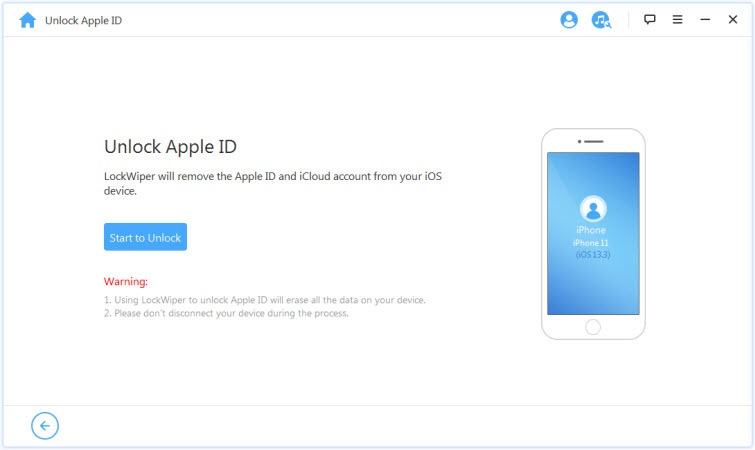 Simply removes Apple ID and iCloud account from your iPhone or iPad to allow you to set up a fresh new one. Offers two unique features: Unlock iPhone screen locks and removes Apple ID without a password. LockWiper is highly recommended by top review websites and millions of users. Step 1. Launch iMyFone LockWiper on your Mac or PC, and connect your iPhone to the computer using a USB cable. Step 3. 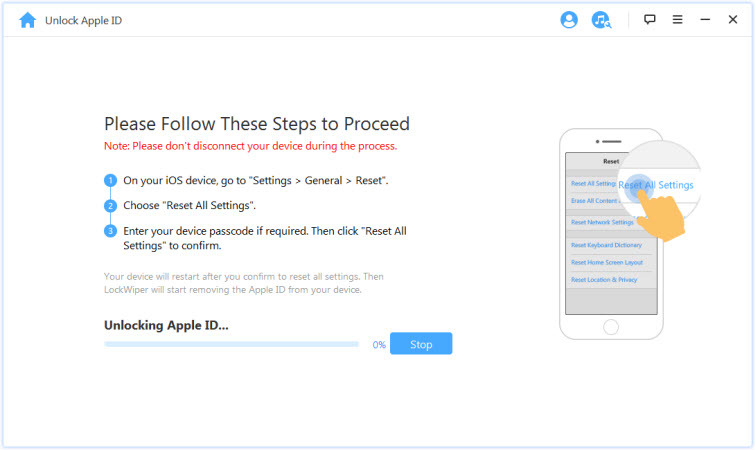 Click “Start to Unlock” tab to remove the Apple ID from your device. Note: When Find My iPhone is enabled in the device, please follow the software's instruction to Reset All Settings.